Our October book to read and discuss is The Paladin Prophecy, by Mark Frost. Graphic background shows, against red flames, a black shield with two swords crossed behind it, so all you see is their hilts and parts of their blades. Coming out on both sides of the shield are black feathered wings. In the foreground, are the words, in gold, "The Paladin Prophecy". This is a partial image from one of the book covers. 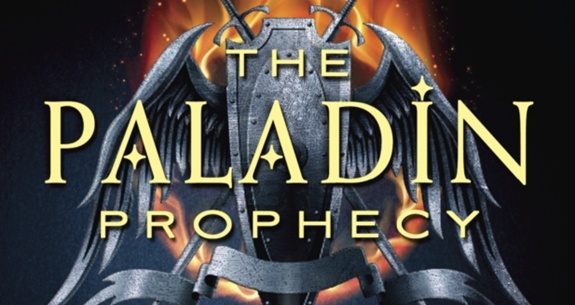 Here's a possible guideline for reading The Paladin Prophecy. Read it at your own pace ... but know that if it grips you, you might finish the book in just a couple of days. If you are reading this book, and feel the urge to write, or draw or create something about it, please feel free to share some of creations in fan fiction, poetry, stories or fan art. Yes! I WILL read this month. Failed last month though may try to read it again and post anyway lol.